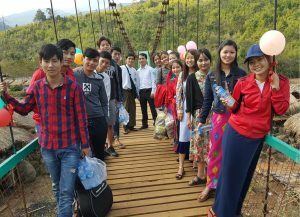 We were so blessed to be able to return to the Church of Christ and to Faith Theological Seminary again this year in Myitkyina, Myanmar. We were warmly welcomed by the pastor, elders, deacons, teachers, students and the church congregation. Brother Ward Deaton teaching on Godly parenting. FTS students are standing on a bridge that connects both sides of the river. 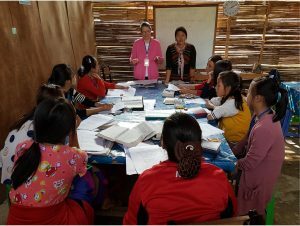 Just like the Christ they are learning, connects them with God and partners like you from all over the world. 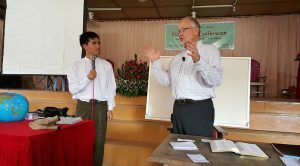 Thursday and Friday were spent teaching about “Godly Youth” at FTS, (Faith Theological Seminary). It’s exciting to see the spiritual growth in the students at FTS. This is the second year for FTS, with 18 students who are doing very well in their studies. Their lessons are all taught in English, using the NKJV Bible. Sister Becky taught 2 sessions on “Growing in Godliness” to the young sisters at FTS. We continue to pray for the four men that teach at FTS, for their families, the growth and purity of the students, for the church leadership, and congregation. We ask for your partnership in these prayers – that God would continue to bless and convict. The above article was written by Brother Ward Deaton from Zillah, WA, who served in both the whole church conference and the FTS conference as a guest teacher. His wife Becky assisted in teaching the girls class. MTM is humbled and grateful for their availability and sacrifice they demonstrated by participating in this Blessed Gospel Opportunity in SE Asia! A very BIG thank you to God, and to all of you who support this ministry. TO GOD BE THE GLORY, GREAT THINGS HE HAS DONE!! Editors note: when viewing photos, you can also read captions for each photo simply by clicking on the “i” (with a circle around it) at the top right side of the screen.